Cheekwood is committed to making its exhibitions, programs and services as accessible as possible, and is actively working to make its grounds and facilities user-friendly. However, due to the historic nature of much of the gardens and mansion, some areas may present challenges to those in wheelchairs, or who have difficulty walking or climbing. Each parking lot includes reserved spaces for those with mobility challenges. Cheekwood’s grounds are accessible by paved pathways throughout the gardens and leading to the museum. Many garden areas can be reached in a variety of ways, including stair-free options for most specialty gardens. Wheelchair ramps and an elevator are available at the Museum of Art. However, due to the historic nature of the institution, certain paths may be narrow, uneven, or steep, and select rooms inaccessible by wheelchair. Accessible restrooms are located in each building. 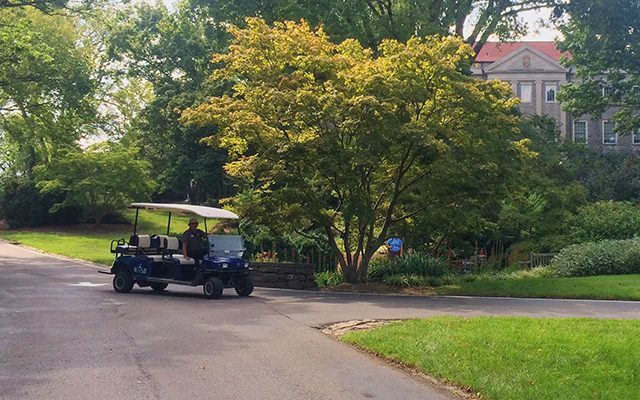 Cheekwood provides manually operated wheelchairs as a courtesy to our guests. They are available on a first come, first served basis and can be checked-out from the Visitor Services Center. Cheekwood has partnered with Vanderbilt Kennedy Center’s TRIAD (Treatment & Research Institute for Autism Spectrum Disorders) to develop resources designed to help families have a welcoming and enriching experience. From arriving at Cheekwood to touring the gardens to taking part in different activities, these Social Stories™ are meant to assist families as they prepare for their visit. Customize your visit to Cheekwood to best fit the needs of you and your family. Visual Schedule Creation Kits can be checked-out from the Visitors Services desk and include a template to sequence stops and activities according to your preference.